For research use only. A fully comprehensive RNA panel for biomarker discovery and translational research. 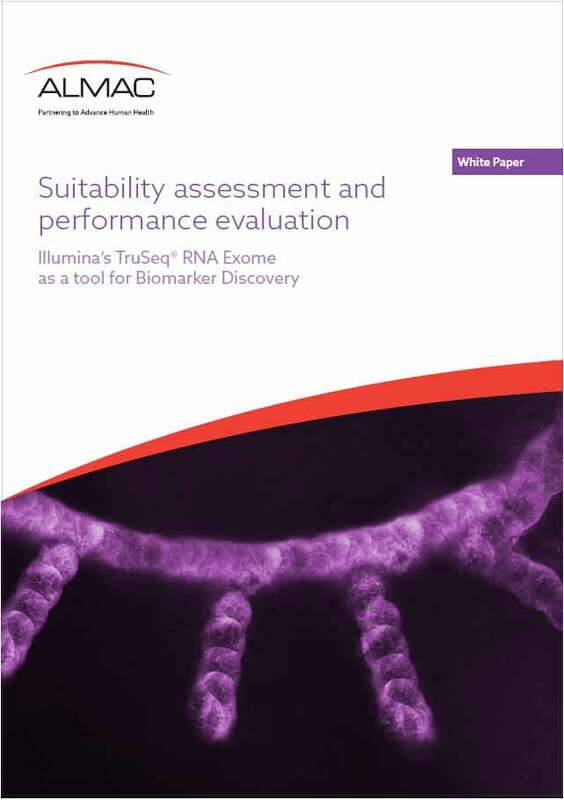 Almac optimized workflow for the Illumina TruSeq® RNA Exome Panel for use in biomarker discovery and translational research. Almac Diagnostic Services has a proven ability to discover, develop and validate high quality, innovative RNA-based biomarkers with an extensive track record in establishing assays across key regulatory standards. We are offering the optimized RNA Exome Panel initially as Research Use Only (RUO) – not for use in Diagnostic procedures. The claraT report is a unique software-driven solution, classifying biologically relevant gene expression signatures into a comprehensive, easy-to-interpret report. Offered as a cost-effective reporting solution from samples processed using the Almac optimized RNA Exome Panel. Helping you to maximize the understanding of your data set, whilst saving valuable research time. The Almac RNA Exome Panel is an optimized Next Generation Sequencing (NGS) solution built on the Illumina TruSeq® RNA Exome chemistry and run on the NextSeq500 and NextSeq550 that detects RNA gene expression from solid tumor samples. The platform covers approximately 99% of the RefSeq Exome with sequencing data and easily interpretable gene expression matrices for use in biomarker discovery and translational research across multiple disease indications. Data analysis and reporting is performed using an Almac customized bioinformatics pipeline implemented on DNAnexus, a global leader in biomedical informatics and data management. DNAnexus is a cloud-based NGS solution which ensures scalability and security of project data. A significant benefit of utilizing DNAnexus within this offering is the flexibility of workflow optimzation and the ability to customize bespoke pipelines for quality control, alignment & expression estimation. Results in highly repeatable and reproducible gene expression data in comparison to other RNA expression platforms. claraT: cost effective solution, producing an easy to interpret gene expression report. claraT classifies multiple publically available gene expression signatures and single gene targets linked to multiple key biologies, alongside Almac’s own proprietary assays, according to the well-established 10 Hallmarks of Cancer. The claraT report is a pan-cancer solution generated from raw gene expression data, utilizing Almac’s RNA-Sequencing Service.